Updated 3:15 a.m. Eastern with update on final second-stage burn. 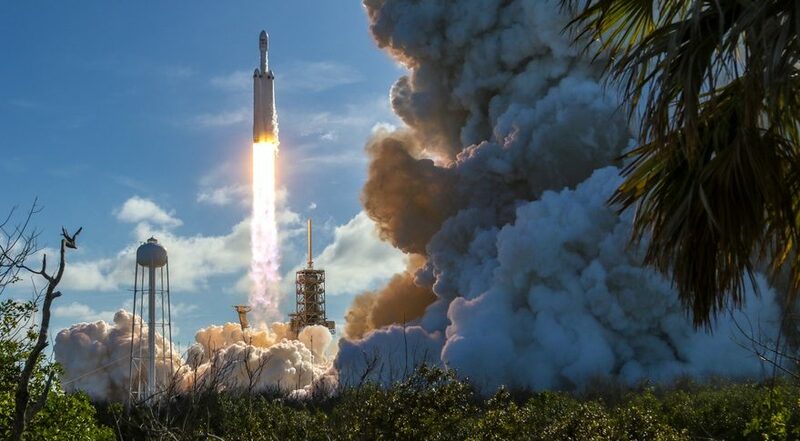 KENNEDY SPACE CENTER, Fla. — A SpaceX Falcon Heavy successfully launched on its inaugural flight here Feb. 6, placing a demonstration payload into orbit and boosting the company’s interplanetary ambitions. The upper stage performed two burns that placed itself and its demonstration payload, a modified Tesla Roadster, into an elliptical orbit of about 180 by 6,950 kilometers. A final burn about six hours after launch was designed send the payload into a heliocentric orbit between the Earth and Mars. SpaceX Chief Executive Elon Musk later tweeted that this final burn over-performed, putting the payload into an orbit that takes it out into the asteroid belt. The one setback for the launch was the failure to land the center core booster. The center core attempted to land on a drone ship downrange, but Musk said that the landing failed when only one of three engines ignited for the final landing burn. 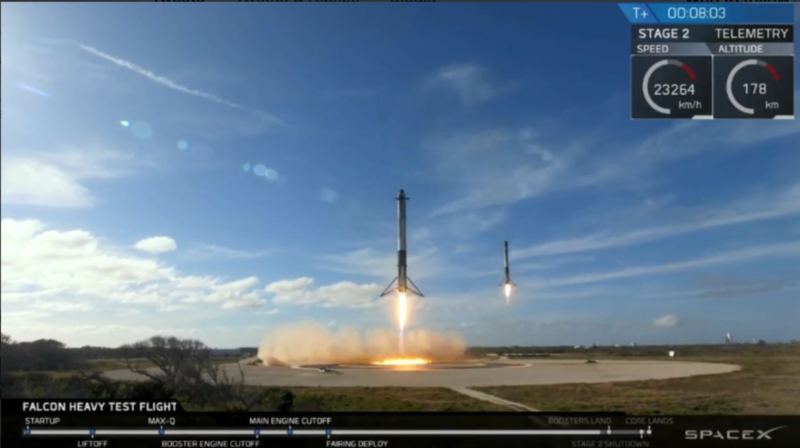 Two of Falcon Heavy’s three core stages make a synchronized landing. The third core stage was programmed to land on a droneship at sea. Credit: SpaceX via Twitter. The launch is a long time in coming for SpaceX. At an April 2011 press conference, Musk said the vehicle would be ready for a first launch in 2013. Development difficulties, as well as higher priority given to the company’s Falcon 9 vehicle and Dragon spacecraft, delayed the vehicle’s first flight by several years. Musk, at the post-launch briefing, acknowledged those issues, and revealed that he had considered cancelling the Falcon Heavy on three separate occasions because it turned out to be much harder than expected to develop the rocket. “We tried to cancel the Falcon Heavy program three times at SpaceX because it was like, ‘Man, this is way harder than we thought,'” he said. The company had to redesign the center core booster to handle the loads, as well as the grid fins used for landings because of changes in the vehicle’s aerodynamics. “I’m guessing our total investment is over half a billion [dollars], or more,” he said of the Falcon Heavy development cost. During those delays, the launch market has evolved. Improvements in the performance of the Falcon 9 now allow it to launch large commercial communications satellites that would have previously required the Falcon Heavy. Demand for such satellites has also dropped in recent years, based on declining numbers of orders of such satellites, as commercial operators weigh the effect proposed satellite constellations, as well as smaller satellites, have on their fleet replacement plans. Falcon Heavy is designed to place up to 64 metric tons into low Earth orbit and 26.7 metric tons into geostationary transfer orbit. Those figures, Musk said, assume using booster core based on the upgraded Block 5 version of the Falcon 9, whose first flight is later this year. This demonstration launch used older versions of the booster core with somewhat less performance. One potential market SpaceX may be targeting for Falcon Heavy is the launch of large national security payloads. The six-hour coast of the second stage after orbit insertion will simulate a mission to insert a payload directly into geostationary orbit, Musk said in a teleconference with reporters Feb. 5. Such trajectories are used for some Air Force and National Reconnaissance Office payloads. A former Pentagon official now advising SpaceX said that the Falcon Heavy may be compelling to the Defense Department given both its payload capacity and its low price. Falcon Heavy can serve the “modest” set of satellites that otherwise require the Delta 4 Heavy, but do so at a far lower cost. “If I was still part of the DOD acquisition team I would be enormously excited about this chance to use the savings” for other defense needs, he said. The payload for this demonstration flight is Musk’s own red Tesla Roadster, an unconventional choice that has attracted attention and some criticism. A mannequin dubbed “Starman” wearing a spacesuit SpaceX has designed for its commercial crew program is sitting in the driver’s seat of the car. That was the case, with SpaceX offering livestreamed views from the car, and of the car from the payload adapter, for several hours after launch. The YouTube livestream attracted more than 100,000 viewers at times.